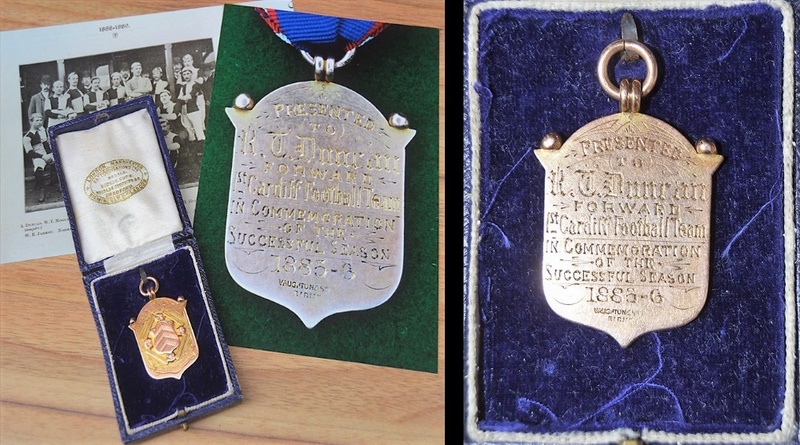 Very Rare Early 1885/86 Cardiff Rugby Football Club gold Medal presented to player R.T Duncan: Magnificent originally-boxed gold medal with watch-chain loop, with a raised and decorated Cardiff 'Villa Cardiff' Coat of Arms to the front and engraved to the rear for RT Duncan, forward of Cardiff RFC in their 1885-6 'near-invincible season', after only a decade of the club's existence, when only a defeat in the last, rearranged match with Moseley prevented a 100% record. 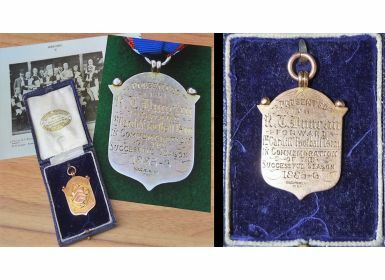 Medals were struck in any event, bought by supporters' subscription, and this example has clearly been carefully kept ever since. Unlikely to be an opportunity repeated any time soon; superb craftsmanship and memorabilia. Box, with some wear through age, bears the famous Fattorini manufacturer's name. Very special and in grand condition.